We’ve heard reports from riders and are aware that the real-time arrival sign still isn’t working at the California Avenue Southwest and Fauntleroy Way Southwest intersection (Morgan Junction). King County networks staff and Metro’s electricians and radio technicians are working to resolve ongoing problems with the wireless communications systems affecting the real-time arrival signs there. We’ve made these locations a priority to fix, but more troubleshooting is needed to identify the source of the problems. We are working on it. On Tuesday, there also were other signs on the corridor that were not functioning properly, and have since been fixed. These problems included hardware (we had to replace a sign Tuesday morning at the Alaska Junction) and an electrical problem with the sign at the Fauntleroy Ferry Terminal that required a site visit to reactivate the sign. On Wednesday we were able to establish communications at 35th Avenue Southwest and Southwest Barton Street, and activate the sign there. Metro staff actively monitors signs to make sure they are working – and respond as quickly as possible when they aren’t. 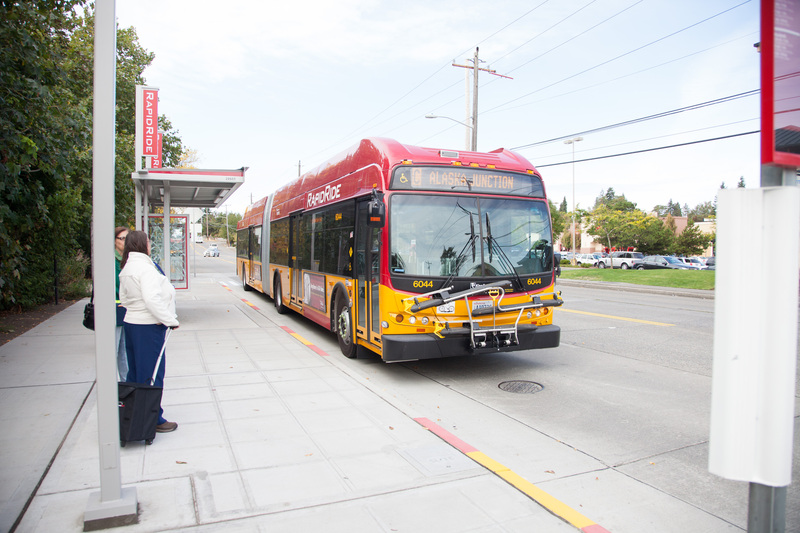 We also have heard from riders and are aware that three signs aren’t active on the D Line: 15th Avenue Northwest and Northwest 65th Street, First Avenue and Denny Way, First Avenue and Republican Street. We’re working with Seattle City Light and are hoping they can make electrical connections as soon as possible to activate these signs. If you see a sign that isn’t working, you can report it by calling 206-553-3000 or email customer.comments@kingcounty.gov. What does it mean when a sign counts down to zero, but no bus comes, then it resets to a higher number like 13 or 15? Has the bus disappeared into the Bermuda Triangle below the Ballard Bridge? I’ve seen this happen twice now. Once downtown (northbound) and once in Ballard (southbound).